The Most Gorgeous Hand Jewellery we spotted on Real Brides! Beautiful bridal jewellery is undoubtedly one of the most integral parts of the Indian bridal look. It can simply make or break a bride’s look on the most special day of her life. It's not always that the choker, nath or the mang tikka that's gotta get the attention ladies! Sometimes it’ll be your breathtaking haath-phool or your larger than life finger ring or that statement wristlet which will become the show-stopper! Yeah we love the brides-to-be who experiment with their hand jewellery, it makes your mehndi laiden hands even more beautiful! 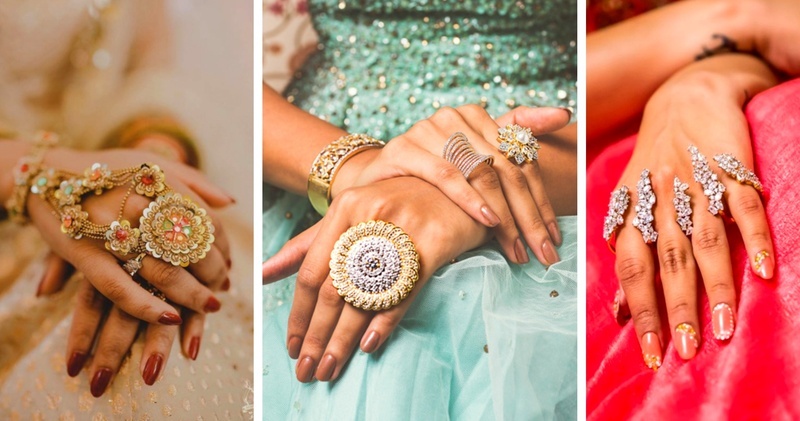 So without much further adieu, here are some breathtaking bridal hand jewellry designs that we spotted on real brides! How stunning are all of these? #BridalGoals right?